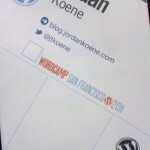 I had the opportunity to attend wordcamp SF 2011. This was my first wordcamp and will certainly attend many more. During the event I learned many valuable WordPress skills including dealing with multilanguage WordPress installs. Not that I have any need to do this… or maybe I should start blogging in Spanish. Anyway, I also connected with old friends including visiting with Chris Wallace. Chris has started up a great WordPress theme based company called upthemes.com. Check them out! Made it to wordcamp! On my way to jedi master wordpress guy!